A great bargain at its base price, the HR-V is best in EX trim that balances some nice features with a still-reasonable price tag. The 2017 Honda HR-V entered the market last year and has already cemented its standing as the segment's practicality-oriented choice early on thanks to Honda's almost religious devotion to interior packaging. For 2017, the HR-V returns essentially unchanged from last year and continues to be available in LX, EX, and EX-L trim levels with a choice of front- or all-wheel drive and, depending on configuration, either a 6-speed manual transmission or a CVT. The HR-V marked a new entry into the subcompact segment for Honda, where it sits below the automaker's hugely popular CR-V in order to take on the Mazda CX-3, Chevrolet Trax, and Jeep Renegade. At its core, the HR-V is a Honda Fit with a taller body, but there are some distinct differences. The HR-V offers all-wheel drive and has an interior outfitted with nicer materials and more features. The Honda HR-V stands out from its rivals starting at its nose, where the stubby crossover wears a front fascia akin to that of the current CR-V. Beyond that, the HR-V wears playful, jazzy shape with a roofline arched for increased head room, pronounced front fenders, and bulging sheet metal that extends from its rear down its side, beneath its hidden rear door handles. All HR-Vs ride on attractive 17-inch alloy wheels, albeit with relatively low profile tires. Inside, the HR-V is simply nicer than its Honda Fit sibling, thanks to additional sound deadening, higher-quality materials, and closer attention paid to finer details. Honda's infamous dual-screen infotainment system won't be found here—and we're just fine with that. Unfortunately, the HR-V's merely adequate acceleration doesn't mimic its exuberant styling, offering little of the fun-to-drive nature we've come accustomed to from Honda. Blame that on a drivetrain derived from the one used in the subcompact Fit, though it does return stellar fuel efficiency. 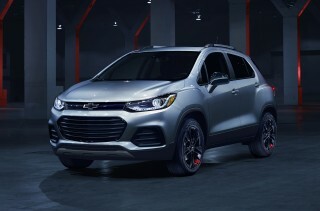 The 1.8-liter inline-4 produces 141 horsepower sent through either a continuously variable transmission (CVT) or a six-speed manual—the latter available only on front-drive LX and EX models. While not a heart-pounding, high-revving mill, the 1.8 liter is strong enough to merge you onto the highway safely. Ride quality takes priority over flat cornering, but the HR-V is nonetheless sufficiently confident and balanced—just how most users will probably want it. Tuned for the everyday challenge of the daily commute, the HR-V sports relaxed steering and its suspension keeps body roll under control, even on roads suffering from differed maintenance. The HR-V is the current king of utility and comfort among subcompact crossovers, crucial factors for buyers in the market for a "lifestyle" vehicle. It's the roomiest vehicle in its class, with a vast 100-plus cubic feet of cabin space on the base-model LX trim (going up to EX and EX-L trims drops that number to 96.1 cubic feet). Additionally, front and rear seat comfort is fantastic and adults are gifted especially excellent head and leg room in the rear considering this diminutive 'ute's dimensions. Like it's little brother, the HR-V comes with Honda's signature "Magic Seat," a trick solution that allows the second-row seat to fold and flip to provide multiple seating and storage configurations. Honda specs the HR-V at 24.3 cubes of storage behind upright second-row seats and 58.8 cubic feet of storage space with the second row flat—but with Magic Seat, the HR-V far more flexible than any rival. On the safety front, the federal government gives the HR-V a five-star rating overall, but results are mixed from the Insurance Institute for Highway Safety (IIHS). Still, Honda's smallest utility comes with a rearview camera, tire pressure monitoring, traction control, and a host of airbags as standard kit; Honda's nifty LaneWatch sideview camera system is an optional extra. Unfortunately, buyers clamoring for blind-spot monitors, automatic emergency braking and adaptive cruise control will have to look elsewhere as they're not offered on the HR-V.
From the base-model LX, the EX trim adds a decent infotainment system, heated seats, and Honda's unique LaneWatch system that displays the vehicle's blind spot on its center screen when the right turn signal is activated. The EX-L adds leather and navigation, but its price tag comes perilously close to a lower-spec CR-V. The HR-V scores its best fuel economy when the 1.8-liter four-cylinder is teamed with the continuously variable transmission and front-wheel drive, returning a best-in-class 28 city/35 highway/31 combined mpg. 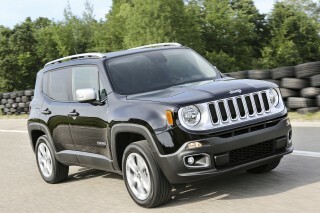 All-wheel-drive models see those ratings diminish to 27/32/29 mpg. Simple inside and quirky outside, the Honda HR-V stands out from the crowd in ways we really like. Though it might share its underpinnings with the Honda Fit, the HR-V's styling riffs on the larger CR-V.
Honda gunned for a popular coupe-like look for the HR-V, with the upward sweep of its rear roof pillar and the embedded, almost hidden, rear door handles. 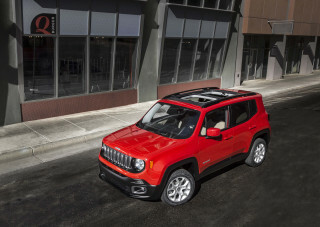 Its roofline arches to provide more head room and its fenders curve and swell around its 17-inch wheels. 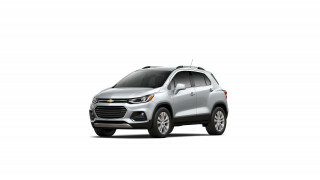 We don't think it quite looks like a coupe, but it certainly stands out against more conventional offerings like, say, the Chevrolet Trax. From some angles, the HR-V appears as if it cues up Acura touches. Park next to an Acura RDX and you'll swear the Honda is its little brother. Inside, you won't see the dual-screen infotainment clutter found in larger Hondas. Instead, the HR-V's interior is very tidy with better finishes and materials than you'll find in the more budget-oriented Fit. Foibles here and there pock the otherwise perfect dash, such as slim air vents cut into the passenger side that feel like an afterthought. Opt for the EX and EX-L and there's an infotainment touchscreen that doubles as a display for the safety and audio systems (but lacks a volume knob). We like Honda's touch-sensitive climate controls, which look like they came from a higher-end car, but they're not all that easy to operate while you're driving. The HR-V rides well, but it's not especially fun to drive and it can feel underpowered with a load of passengers or cargo aboard. Honda knows how to build a polished and sporty small car, but the HR-V really only falls under that first category. In the U.S., Honda fits the HR-V with a 1.8-liter inline-4, a larger variant of the 1.5-liter it squeezes into its Fit hatchback. There's more power here, to the tune of 141 horsepower and 127 pound-feet of torque, but even in manual transmission, front-wheel drive configuration, the HR-V is pokey at best and would make for a boring drag race against the Fit. Any acceleration potential from the slight power boost over the Fit are negated by the HR-V's added pounds for its taller body, its additional features, and—when so-equipped—its optional all-wheel drive that adds a few hundred pounds on its own. Power is sent through Honda's continuously variable transmission (CVT) or a six-speed manual, the latter of which is exclusively offered with front-wheel drive on the LX and EX. Manual shifts are fine and Honda should be commended for offering it on a vehicle further from the enthusiast manual-seeker than the Fit. Most HR-Vs will undoubtedly be built with the CVT, which boasts a nice sport mode delivering some snappier response but inevitably feeds more fuel to the engine since it encourages faster driving. We're not fans of this gearbox, but at least Honda offers paddle shifters that run through simulated, programmed steps in the CVT's logic bank to make to feel like Ayrton Senna at 1/10ths speed. On the handling front, the HR-V is absorbent for a small crossover and better at soaking up bumps than the Jeep Renegade, Fiat 500X, and Chevrolet Trax. That's thanks in part to Honda fitting only 17-inch wheels to this crossover and not the 18s seen on some rivals. Big wheels are not always better, folks. Underneath, there's a conventional strut front and torsion beam rear suspension setup that isn't tuned for sporty driving as much as it is for mainstream comfort. Though the HR-V is confident on a twisty road, it is far from entertaining. 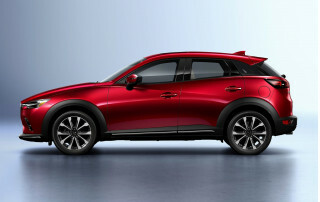 If that's your priority in a small crossover, the Mazda CX-3 is your default choice. 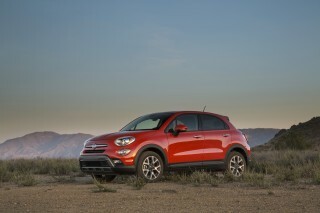 We think it's an agreeable tradeoff, however, given the way most buyers will want to use their small crossovers. The optional all-wheel drive system is only available with the CVT and it's a simple automatic system that requires no driver intervention. It's not meant for serious off road work like the more complex traction control setup found in the Jeep Renegade, but it will suffice for a snowy driveway or a rainy day. Honda's excellent packaging triumphs yet again in the versatile and roomier-than-it-looks HR-V. The Honda HR-V is among the largest of the small crossover SUVs—”a "jumbo shrimp," if you will. It's more compact than the automaker's CR-V, but it's bigger inside where it counts than rivals like the Fiat 500X and Jeep Renegade. 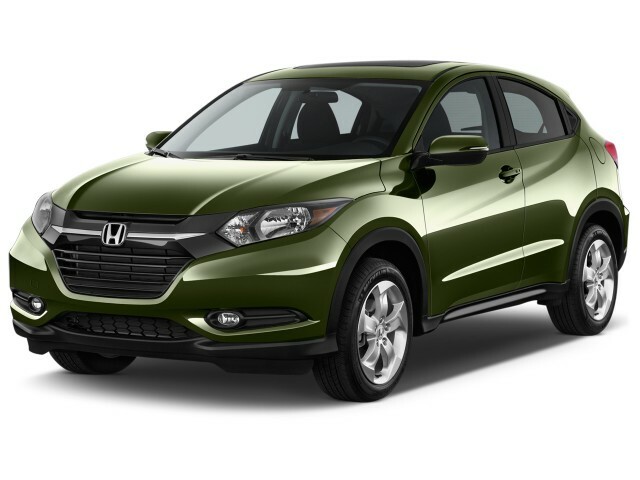 By the numbers, Honda's HR-V measures in at 169.1-inches long and sits on a 102.8-inch wheelbase. Moreover, it's relatively wide at 69.8 inches, and interior volume tops out at 100.1 cubic feet on base models; 96.1 cubes on the EX and EX-L since those models come standard with a moonroof. Even with that glass panel, there's decent head room. Back seat passengers have decent leg room; four passengers here is acceptable, whereas rivals make the second row a very tight fit. In the HR-V, three small children could easily be belted in, something we can't say for most subcompact crossovers. The front seats are supportive, but their seat bottoms angle down toward the front and could use a little more under-knee bolstering for optimal comfort. The "Magic Seat" system in the Fit is also found in the HR-V, opening up the interior to all sorts of storage possibilities. The system allos the rear seat to flip and fold in multiple positions to maximize interior cargo space depending on your needs at the time. You fold up the rear seat bottom and flip its front support away to lock the cushion against the seat back, leaving an even lower cargo floor where the rear-seat passengers would normally sit. There's 25 cubic feet of space behind an upright rear seat for cargo. Fold them forward and it grows to an impressive 58.8 cubes. Mercifully, Honda has spared the HR-V from the dual-screen curse that plagues some of its bigger models. Instead, you'll find a tidy interior with nicer materials than we expect to see at this price point. It really feels different from the Fit inside—and that's because it is. LXs are a little more sparse inside than their EX and EX-L siblings, which add a 7-inch infotainment system (with navigation on the EX-L). Beneath its center console between the front seats sits some semi-hidden storage space. The USB ports (one in LXs, two otherwise) are tucked inside it, making them a bit difficult to use. On the other hand, the HR-V's steering wheel has convenient and intuitive controls. Seeing as the HR-V is based on the Fit, one might expect to experience similar noise levels in the crossover's cabin. But Honda has damped road noise by bringing some additional sound deadening material to the HR-V. On top of that effort, the HR-V is given materials better befitting its price point, such as soft-touch plastic on the dash, though black cloth pieces atop its door panels look like a future wear-and-tear nightmare. The HR-V's crash test scores aren't the best and it lacks some of the safety tech offered on rivals. We're little surprised with the mixed results the 2017 Honda HR-V garnered from the two main testing agencies—the federal government and the Insurance Institute for Highway Safety (IIHS). We're a little surprised that Honda's HondaSensing suite of tech—which includes the aforementioned two items plus lane departure warning—isn't available on the HR-V. The HR-V achieved a five-star overall result in National Highway Traffic Safety Administration crash testing, although it received just a four-star rating in front impact tests for both driver and passenger in both crash-test dummy sizes. The IIHS bestowed upon the HR-V some top "Good" scores, but it was rated as merely "Acceptable" in the side-impact and the especially demanding small-overlap crash tests. A rearview camera is standard, although EX and EX-L up the ante with a wider-angle camera and LaneWatch, a right-side camera system that displays a view down the right side of the body when you activate the right turn signal. The usual view takes some getting used to but its superior to the typical beeping blind spot monitors found in other vehicles. Considering the near daily upward migration of vehicle beltlines and horizontal growth of roof pillars, the HR-V's visibility is better than expected, especially rear visibility outward. Improving visibility further, rear-seat headrests can be dropped, providing a completely unimpeded view when reversing. The base HR-V is outfitted nicely, but there aren't many customization options. The Honda HR-V is sold in three different trim levels: LX, EX, and EX-L, and all are well-outfitted for the money. The base HR-V LX comes with power windows, locks, and mirrors, as well as a 5.0-inch touchscreen audio system with a single USB port. Bluetooth with audio stream, 17-inch alloy wheels, a backup camera, cruise control, and the Magic Seat. From there, the HR-V EX gains a 7.0-inch touchscreen, the smart, Honda-only LaneWatch camera, smartphone connectivity with Pandora streaming audio, heated cloth front seats, keyless ignition, automatic headlights, an additional USB port, a power moonroof, paddle shift controls (on CVT-equipped models), automatic climate control, and heated side mirrors. Front-wheel drive LXs and EXs can be fitted with either a 6-speed manual transmission or a CVT, while the all-wheel drive model is CVT-only. The EX-L is also available with front- or all-wheel drive, but it comes only with a CVT. The EX-L brings to the table standard leather seats, steering wheel, and shift knob, navigation, satellite radio, and roof rails. All HR-Vs come with a three-year, 36,000-mile warranty and roadside assistance, as well as five years or 60,000 miles of powertrain coverage. At 31 mpg combined for the front-wheel drive HR-V, you'll pass a lot of gas stations. 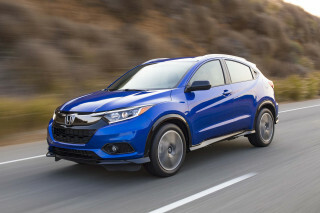 The Honda HR-V scores some of the best fuel-economy ratings in its small-SUV segment, according to the EPA. The EPA slightly revised its testing procedures for 2017, so the HR-V sees a small drop from last year, at least on paper. But it's still good for 28 mpg city, 34 highway, 31 combined with front-wheel drive and the optional CVT. Opt for the manual and those figures decline to 25/33/28. The all-wheel drive HR-V, which is CVT-only, comes in at 27/31/29. 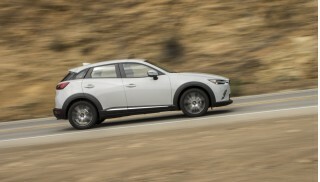 Only the Mazda CX-3 bests the HR-V, offering 29/34/31 with front-wheel drive and 27/32/29 with all-wheel drive. I purchased my Honda HRV on Richmond road in Ottawa, and it's excellent on gas milegage in comparison to other brand names/models. I highly recommend the HRV from Honda. Looking for a different year of the Honda HR-V?